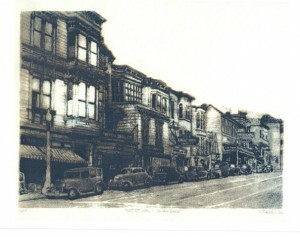 SAN FRANCISCO — “Days of Fire and Glory” is a free program being held in conjunction with the JAM (Japantown Art and Media) Workshop poster exhibit in the NJAHS (National Japanese American Historical Society) Peace Gallery, 1684 Post St. in San Francisco Japantown, on Saturday, April 13, at 2 p.m. It will be a reunion of artists associated with JAM, who will discuss their involvement in the JAM Workshop. They will reminisce about the “life and times” of JAM and then segue into what they’re all up to now. Artists will bring their portfolios to share. From 1977 to 2000, JAM Workshop produced community-based art and provided a vairety of classes. One of JAM’s most important services was screen printing. Colorful, imaginative hand-screened posters were produced to commemorate and announce local Asian American events, from political rallies to fundraising dances to festivals and community picnics. The exhibit revisits some of the memorable, exciting and significant posters produced by JAM’s graphic artists. As April 13 is the first day of the 2013 Northern California Cherry Blossom Festival, it will be a good opportunity to check out both the festival and the JAM poster show. For more information, call (415) 921-5007 or visit www.njahs.org.